Starring Edward Andrews, Sue Ann Langdon, Vaughn Taylor. Miles Tundifer (Andrews) has had it up to here with his batty Uncle Pontifex (Taylor) spending Miles' inheritance fixing up dusty old mansions. Fortunately for Miles, there's something different about the latest fix-me-upper—it's a doorway to another time period. 1890 to be exact. This gives Miles the idea to off Pontifex and dump his body in the past. Unfortunately for Miles, the house's inhabitants have other plans. PE: Right off the bat, the return of Morton Stevens' gawdawful "dum-da-dum-da-dum-plop-boom" sit-com score lets me know I'm in for a long show. And that's just what I got. A tired storyline peppered with semi-interesting ideas that go nowhere (what would happen if the Keystone Kops actually did go out the front door with Miles?). Another nail in the coffin of the Thriller comedy. A show so dull I can find hardly anything interesting to say about it other than to point out the blacked out sections of the covers at the used book stand Miles patronizes. Isn't that interesting? 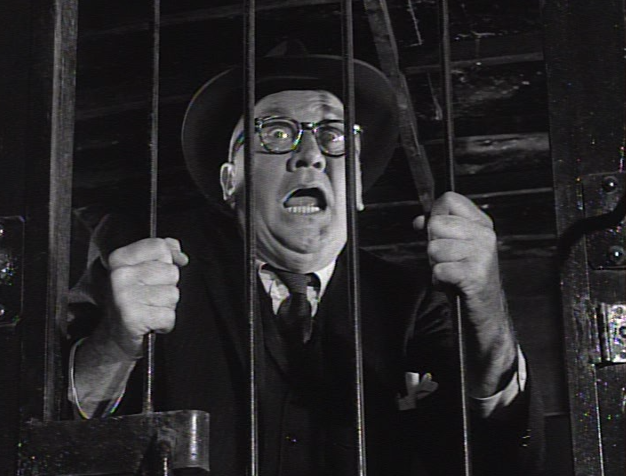 JS: How can you not get excited by another Edward Andrews episode? Frankly, his presence calls for the playful percussion of Morton Stevens. To me it's a pairing as perfect as Don Knotts and Vic Mizzy. And Vaughn Taylor gets to chew the scenery as Uncle Pontifax; I almost didn't recognize him from his role as Lowry, Janet Leigh's boss from Psycho. Sue Ane Langdon (Queenie), on the other hand, portrayed a caricature that I was not impressed with. And based on the look of her, that's not Miss Devore's wig she's wearing. PE: Miles Tundifer enters the old house through the front door on Beaver Lane (aka Back Lot City, USA) and exits the back door onto Andrew Bentley's estate! Although the view changes constantly during the episode. JS: I thought this was fun. While you knew things weren't going to go as planned for Miles, it has a nice little twist at the end that I thought was fitting for this episode. 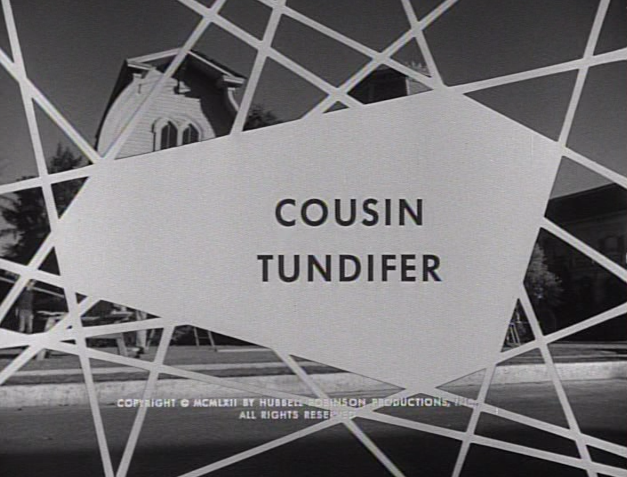 I think it's fair to say if you haven't enjoyed Edward Andrews' episodes of Thriller up to this point, you won't start with "Cousin Tundifer." But if you have enjoyed his other Thriller excursions into the land of black comedy, this one is good for some more of the same (you are 100% right. -PE). PE: Howard McNear is instantly recognizable to those of us who grew up on a steady diet of The Andy Griffith Show as Floyd the barber. JS: Next up, "Markesan." Will Season 2 finally get its 4-Karloffer? Netflix does not want me to have these. It jumped over five disks of Thriller to send me The Human Centipede. You can always tell an old magazine collector, because upon seeing a dvd newstand scene from long ago, he will frantically reach for the remote to pause the picture. He then will carefully study the newstand hoping to identify a favorite pulp title or a digest like MANHUNT. Nostalgia is such a great feeling. I still replay in my mind the day I bought my first digest, a copy of the Feb 1956 GALAXY. Somehow that one copy has multiplied into a houseful. 1/ It's a fantasy involving time travel and in particular the sub-genre of time-slips. 'Twilight Zone' did it magnificently in 'Walking Distance', '100 Yards over the Rim' and to a lesser extent but also vividly, 'The Last Flight'. Here, the idea of a house being so authentic that it recalls and bridges to the past makes it evoke memories of Matheson's 'Somewhere in Time' and his spiritual godfather, Jack Finney (and 'Berkely Square' and 'The House on the Hill'). But it's not a good fit for this show. Had it thrown off a horror masterpiece, week after week, a little excursion would have been excusable. 2/ It's god-damned comedy! Something both TZ and Thriller should never be near. 'A Good Imagination' was highly entertaining and I suspect that this is an attempt to recreate that solid but middling success. Perhaps the best of it is the opening prolog, which conveys the essence of the show visually and economically. The music is jaunty and delightful for a comedy to begin with but soon wears out it's welcome, especially as it kicks off every time he steps into that house. Every character is unsavory and shady which allows little room for empathic engagement. The performances are all slightly larger than life caricatures befitting a loopy comedy. The transitions into the past are crafted with aplomb. The best thing about it is the photography, which must rank along with the best of 'Naked City' and 'The Outer Limits'. At half an hour, it might have made a passably good episode....for the TZ. Netflix has some goofy rules. If Disc 1 of a series is not available (say, it's on Short wait or Long wait), they won't send you any of them until they can send you the first. Try moving Disc 1 to lower than Disc 2. That's what I did with LOST Season 6 (Disc 1 of which has been on Very Long Wait for two months!!!). I got Discs 2-6 immediately and now I'm patiently waiting for the first one! You are so right!! All I could recognize was The Saturday Evening Post. I'm sure the fiction books were blacked out because 1/they couldn't get permissions or 2/ they didn't want to give any free publicity. Weird then that the magazine covers weren't blacked out. The only Thriller so far that has literally put me to sleep while watching. To be fair, I was rather beat last night; but the fact that this show so closely resembles "A Third for Pinochle" (Edward Andrews in the exact same role, plotting to a murder a family member for money, with a ditzy babe on the side, the same sunny backlot street, and that SAME cutesy/annoying Stevens score) really works against it. Watching these 2 shows so closely together makes it diffcult to evaluate "Tundifer" on its own merits. I guess it's OK overall. Vaughan Taylor sure looked like he was sporting a mighty fine TAN ---and that's the extent of my insightful, laser-like critique...except to say that, if that damned 1890-funky player-piano cue played ONE MORE TIME----I'd be out shopping for a new TV and dvd player right now. FOUR out of TEN Karloffs---(deduct a full one for the series' crap-out decision to fall back on their "sure-fire" Edward Andrews comedy formula). How could I have neglected to mention what may be the coolest line in any of Boris' intros? As he describes the plot's "twists and turns", he tells us that his "head reels; and for a moment...but ONLY for a moment, I cannot even be sure if my name IS Boris Karloff." Beautifully delivered; the man was a delight. While I had some of the same 'quibbles' as my forebearing critics, I daresay that there were a couple saving graces that allowed me to enjoy Cousin Tundifer. Finally, Boris' best introduction yet, looking like he was eager to ramp up the mischief if invited -- the table-ful of deadly weapons, followed by his warm yet droll spiel, then a gunshot. Wow! It counted for one full Karloff head in itself. Yes, the quaint premise becomes a tad overdrawn and the music of the drawing room definitely grated on the nerves, but the pluses out weighed the negatives for me. Six and a half Karloffs! This is the worst of the 3 Andrews episodes to me- I found him too overbearing in this one, in the other 2 he was much better, every character in this is just too unlikeable for me. 1 1/2 Karloffs, #50 out of 67. Cousin Tundifer is the third showcase for Edward Andrews. As with A Good Imagination and A Third For Pinochle, Andrews plays a witty schemer. Tundifer has Edwards following the Pinochle "Didn't cover all my bases" formula, which at times borders on a sitcom level. Maybe since I watched Tundifer after Pinochle I felt as if I saw this episode already. Regardless, Andrews makes Tundifer fun to watch. I would have loved to have been involved in that writers roundtable where the discussed inserting as a plot device, a house which has the ability to transport Andrews back in time 70 years to fulfill Andrew's inheritance scheme. Is this house strictly a portal to the 1890s or do other rooms showcase different eras? I liked the Sue Ane Langdon playing Ann Nicole Smith 30 years before she did it. The ending was cute and zany. Watching Cousin Trundifer was akin to plopping down on the couch and eating some tasty junk food. There aren't any nutrients and you could or should be eating a lot of better things, but it's a quick bit of gratification. The Edward Andrews factor is always worth at least half a star, so I award Cousin T. two and a half Karloffs. I know it's a comedy, but if there's one thing I have a problem with, it's what that woman does to Tundifer's wallet with his I.D. at the end. Even during what people think of as a "simple time" like 1890, would the police ignore someone doing that to a piece of evidence, especially if someone just got through claiming the piece of evidence proves he's SOMEONE ELSE? At the last minute, SHE becomes the villain for me (especially since Tundifer didn't manage to kill anyone), because she ends up more or less "framing" him just to avoid some family scandal! Still, the sight of a VAUGHN TAYLOR character (of all people) going off with an exotic dancer made the ending entertaining. More fun than a barrel of monkeys. Yeah, better than the Poston/Montgomery episode. I like Goldsmith's scores better, but give Stevens a break. Shades of a Twilight Zone genre script-think the dark story of Willoughby--the harried Exec getting of the train. This one has levity. BTW--our star was in the Twilight Zone episode about the family leaving earth on a space ship to avoid nuclear war--hoo boy. He was trying to stop them using all of his force. PE writes, "Morton Stevens' gawdawful "dum-da-dum-da-dum-plop-boom" sit-com score. Naw--I agree with JS. "the playful percussion of Morton Stevens." And Barsh 1956 review is right on the mark..
One uncredited actor in this episode is Nesdon Booth, who plays the bartender. 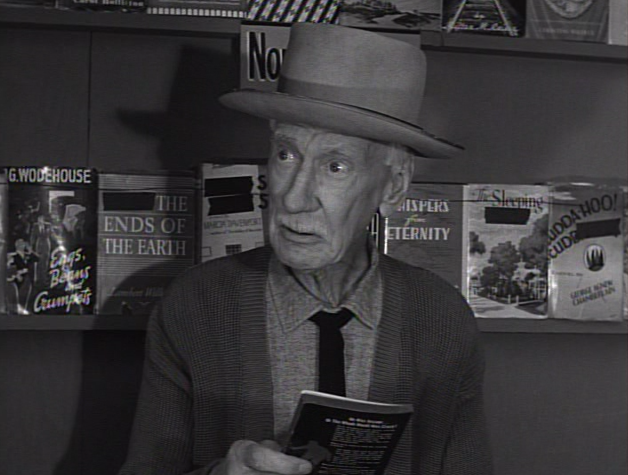 You might remember him as Big Phil Nolan in TWILIGHT ZONE's "The Prime Mover." I can't believe no one mentioned the house featured in the show would eventually become the Munster's mansion. That alone made this episode interesting to me, although that goofy repetitive music got on my nerves. Yes. 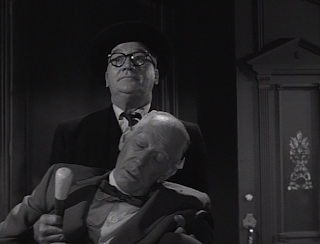 The guy with the glasses, Edward Andrews, was in a Twilight Zone episode. A security type who wanted to keep the family from hi-jacking a rocket to leave a place before nuclear destruction. I love it--they were on the way to Earth circa the height of the Cold War. ME TV keeps this series going--I wonder how much longer? For all those out there in ME TV land-any chance 77 Sunset Strip is revived? Route 66 is alive and well. How about the original Avengers with Diana Rigg or the cult classic the Prisoner with Patrick McGoohan along with Secret agent Man. Let's not forget a sleeper--Espionage so timely today!